There are certain things in the kitchen that scare me to death. Homemade gnocchi tops the list. I can never seem to get it right even when I use pre-made gnocchi. 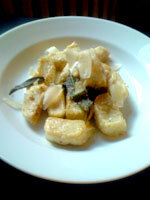 However I was poking around and saw a few posts on the ease of ricotta gnocchi. This came out perfect. Its so simple and clean and most of all satisfying. Heat a large pot of lightly salted water, to boil on high heat. In a metal bowl, beat the eggs. Add in the ricotta, cheese and spices. 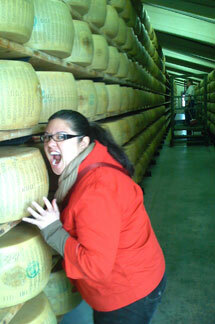 Mix thoroughly with a fork, make sure to break up all of the cheese clumps. Add in the flour and stir to combine. Generously flour your work surface then finish mixing the dough with your hands, it will be pretty wet. 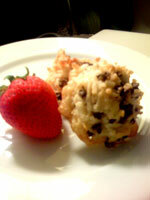 Cut the dough in half and roll it in the flour, to coat the outside. 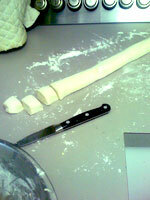 Then roll it out into a long snake, till it is about 1 inch in diameter. Using a small paring knife, cut into 1 inch pieces. Once the water comes to a boil, drop the first batch of gnocchi into the boiling water, making sure not to over crowd the pan. Let it boil for about 5 minutes till done. It will all rise to the top and the water will start to boil higher. While the first batch is cooking, roll out the other batch and cut it. 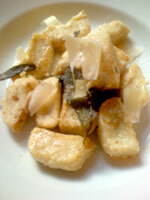 Remove one piece of gnocchi and run it under cold water and taste it to make sure it is cooked through. Using a slotted spoon, drain the first batch to a colander, rinse quickly in cold water to keep it from sticking. Add more water to the pot and return it to a boil. 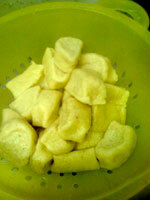 Once boiling, add in the second batch of gnocchi and cook it till done. Drain the cooked gnocchi. In a large skillet, start to melt the butter. 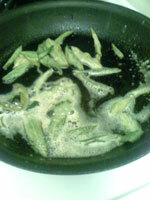 Once the butter is completely melted, add in the sage leaves and stir. Once the leaves look like they are getting crisp and the butter is starting to turn a light brown, add the cooked gnocchi to the pan. Quickly toss to coat in the butter then let it sit for 1 minute to brown. Gently toss the gnocchi again and leave to brown for another minute. 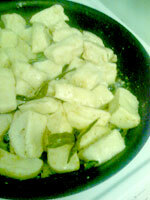 Serve the gnocchi in a bowl, including some of the sage leaves and sprinkle with the freshly grated cheese. I think I learned it from my mom, but I hate to throw things away. After a dinner with Sean, Sabrina and Dave there was leftover rice that was destined for the trash. I rescued it and gave it an elegant new life. 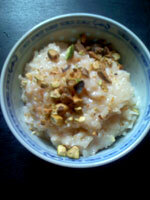 Put all of the ingredients, except the vanilla and nuts, into a medium size pot on medium high height. Stir the mixture and cook until boiling. Reduce the heat to medium low and let it cook for about 30 minutes, stirring occasionally, so that the mixture reduces and absorbs most of the milk. 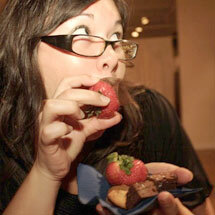 Taste the pudding and check for consistency. You do not want it to be too stiff. It will get thicker as it cools. Turn off the heat and add in the vanilla. You can either serve it hot or cold, sprinkled with the nuts. My best friend David is in a weird kayaking contest where he has to grow a silly mustache. It is so sleazy. But despite how he looks right now, he is still quite sophisticated. 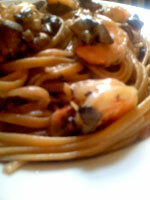 Several years back he devised a killer pasta dish with shrimp and Portobello mushrooms. 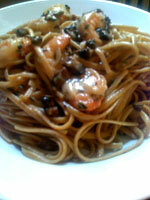 Here is my simplified version that still packs all of the flavor. In another large non-stick pot, heat the olive oil on medium high. Smash and chop the garlic. Add it to the hot oil and turn the heat off. While the garlic is getting soft and just a little golden brown, prepare the shrimp by washing them, removing the tales and de-veining if needed. Turn the heat back on and add the shrimp and salt and pepper. Stir to coat with the oil. Using a spoon, remove the gills from the mushrooms and coarsely chop the mushroom. The shrimp will turn pink and when it is close to getting done, add the mushrooms. You may need to add more olive oil if the pot is very dry. 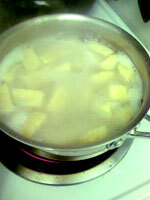 Once the water started to boil, add the pasta and stir. 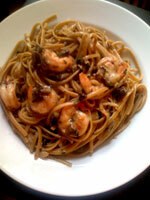 If it is whole-wheat pasta, it will take about 10 minutes to cook so you should add the pasta half way through cooking the shrimp. 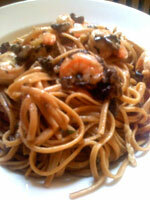 Once the pasta is cook and the mushrooms and dark and soft, add the drained pasta to the large pot with the sauce. Sprinkle the pasta with the cheese, toss and serve. I really enjoy hanging out at the bar around the corner. The guys that work Sunday and Monday nights are so much fun. In addition, I get to see the crazy characters the come through the ‘hood. 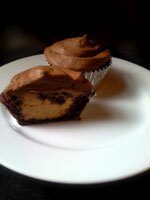 Every once in a while I bake them treats to reward them for all of their entertainment. Preheat the over to 350 degrees. Line two large sheet pans with Silpat mats. In a large box beat the egg whites with a fork. Stir in the sugar, vanilla and salt. Add in the coconut and chips. 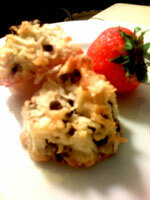 Toss with the fork and switch to your hands to evenly distribute the egg throughout the coconut and chocolate. 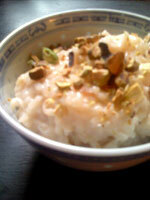 Fill the palm of your hand with coconut, about 2 teaspoons full. 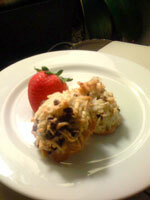 Squeeze the cookie dough, so that the coconut is tightly packed. Place on the cookie on the cookie sheet. The dough should be tall, not a flat cookie. Bake for 25 to 35 minutes until golden brown. Let the cookies cool on the sheet for 10 minutes before removing to a wire rack with a spatula. Finish cooling on the wire rack. I came back from DC and since I cooked up a storm for my sister’s family, I only want to make simple easy things here in my tiny kitchen in NYC. So I made a quick pasta dish that is satisfying and filling yet ready in a flash. Heat a pot of salted water for the spaghetti. Cut off the bottoms of the asparagus and cut the rest into 1-inch pieces. Once the pot of water comes to a boil, cook spaghetti according to package directions (probably about 10 minutes). Heat the olive oil in a large pot on medium heat. Add the asparagus, garlic powder, parsley and salt and pepper. Stir-fry the asparagus until tender, about 5 minutes. Pull the smoked salmon into tiny bit size pieces and add them to the asparagus with the cream and heat through. 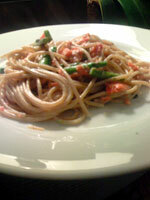 With a pasta scoop, transfer the spaghetti to the sauce mixture, draining most of the excess water. 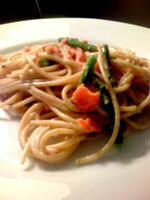 Toss the spaghetti immediately to distribute the asparagus and salmon. The cream should be absorbed by all of the pasta and just barely coat it. Serve the pasta immediately with a fresh sprinkling of fresh ground pepper. WholeFoods has installed an exotic egg bar at the Bowrey location. 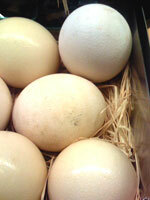 I’m obsessed with the ostrich eggs. They are beautiful orbs that unfortunately sell for $39.99. They look like they would hold about a ½ dozen regular eggs. I want to buy one and turn it into a beautiful chocolate mousse, served in the shell. I can’t justify the expense, so I used my own half a dozen eggs ($2.00) and made a quiche out of the leftover broccoli gratin. 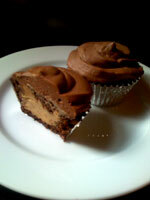 Mix the flour, butter, salt and sugar in a mental bowl with a fork. Mash in the butter until it forms course meal. Gradually add in the water, you may not need all of it. 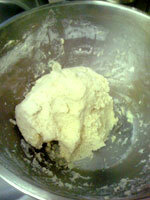 Mix the dough together till it forms a ball. Divide the mixture in half, save one half for another project. Roll out the other half of the dough and place it in a pie pan. Crimp the edges and trim any excess. Cook the bacon in a pan until crisp, drain and discard the fat. Pre heat the over to 350 degrees. Fill the pastry with a layer of broccoli, then a layer of bacon and top it with the cheese. Beat the eggs, cream herbs and salt and pepper in a bowl. Slowly pour it over the quiche. The eggs should come to the top of the cheese, but not over flow. 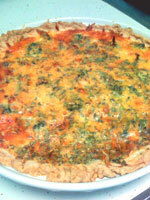 If necessary, beat another egg with more cream, or milk, the herbs and salt and pepper and pour into the quiche. Bake the quiche, uncovered for 1 hour until the top is golden brown.